According to Dictionary.com the word "forgive" can be broken down into 5 or 6 ways. Two of which state forgive as to (1) grant pardon for or remission of (an offense, debt, etc. ); absolve. (2) to cease to feel resentment against: to forgive one's enemies. Just to break down this word a bit further The Word Detective further explains that forgive originates from the Latin word Perdonare which gives us the word pardon. Forgive itself is a literal transliteration of perdonare which means "to give completely, without reservation"(source). I came across a video of the three ladies who were kidnapped as teenagers and found after 10yrs having been held hostage and kept away from their families. In the video Amanda Berry, Gina DeJesus and Michelle Knight give brief speeches regarding their rescue and gratitude to all those who helped pre and post rescue. I have been moved by what all three have said. Even more so, Knight who is the last to speak expresses a forgiveness that has clearly been rooted in God's love and grace. As she spoke I could sense that God was definitely present. Her faith amazes me and even more so her mindset. All three ladies have a God given purpose in life. I am happy for their freedom and pray God continues to bless and heal them thoroughly may every chain of captivity be completely broken in Jesus name. When Michelle Knight says she refuses to let the situation define her but that she will define the situation I was like wow. She further expresses that she does not want to be consumed by hatred. Un-forgiveness can do just that. It can become this consuming fire that gets way out of control. A good example of this can be found in 2 Samuel 13:23-33 whereby Absalom waited and plotted for two years to get revenge against his half brother Amnon for forcing his sister Tamar. Their father King David did not punish Amnon so Absalom took it upon himself to get revenge. He allowed another persons sin to cause him to sin on even a greater scale. Throughout the Bible we are shown God's enduring love for humanity. When Adam and Eve sinned in the garden of Eden, God covered them with animal skins as expressed in Genesis 3:21. He could have left them in their shame and let their sin consume them but God's love is the agape type of love that is unconditional. In Matthew 6 Jesus gives us what is referenced as the Lord's Prayer. In verse 12 it says "And forgive us our debts, As we forgive our debtors." So we can see right there in one of the most important prayers that every Christian tends to know by heart is an expression of forgiveness by us of all who do us wrong. It also clearly expresses that by forgiving our wrong doers that God will also forgive us. (see also verse 14) How will people who recite the Lord's prayer who have unforgiven hearts explain themselves on Judgement Day. Now that is something I never thought about before. It is that deep. In Matthew 18:21-35 we are given the parable of the unforgiven servant. Jesus having been asked about how often shall a person forgive wrong doing by others shares this story with his disciples. A servant owes the King money. He pleads for forgiveness and the King having compassion decides to wipe away all the debt. The same servant is owed money by someone else but refuses to forgive their debt. The king finds out about the unforgiveness of the servant and revokes the pardon and the servant has to repay all his debt due to his lack of compassion to others. He failed to forgive others for the very thing he was forgiven for. Many are easily guilty of doing exact same thing. I have paraphrased the story and do encourage you to read the parable in full. Kelly stated that "it is letting go of what someone has done to you. Not saying that it is right. but not holding any malice or using it against them." Susan explained that, "forgiveness means peace of mind ......when you don't forgive it consumes your soul, trust in God on judgement day!" Te' expressed that, "knowing how important it is to ask and receive the forgiveness is huge! As you know God wont accept our offering unless we are on good terms with our neighbours and even worse if a mans wife is upset with him and he doesn't clear it...there is scripture that says God isn't acknowledging your prayers! Forgiveness is heavy...to think that young lady forgave a guy that treated her that way she set him free completely. Sooo in that respect she has shown REAL love! HUGE!" There is power in forgiveness for the person who has been wronged. True forgiveness releases you from all the hurt and pain and that consuming desire to seek revenge that would lead you to sin. 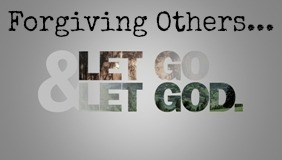 Unforgiveness is said to be a block to many answers in prayers and blessings. Holding on to all that hurt and pain is a poison that can make you physically ill. Release it all to God. In Romans 12:19 God explains that all revenge belongs to Him. You have to release it and allow God to deal with it. Galations 6:1-3 expresses that spiritual people must forgive their wrong doers. Look upon them from Christ's perspective and do not be tempted to sin because of another persons sin. Children are also able to show forgiveness from a young age too. Click here to see Kai express forgiveness to the man who aimlessly shot his gun in the air paralysing her. The man who shot her upon hearing her forgive him changed his plea from not guilty to guilty and he also apologised to her. Kai's mum was also able to forgive him and even hugged him in court. Forgiveness does not mean your wrong doers get away. Trust me they will have their day on Judgement Day. Though it releases you from all that negative energy and feelings and allows you to heal. Many times people who do you wrong do not sit down and think how much they have hurt you. They continue with their lives. God commands us to forgive so we should. Do not give your power over to another person based on what they have done to you. Forgive them and stay in control. Pray about it. In all things pray and use wisdom. Midnight Oil Summit 2013 - Taking Over the City! My friends have attended the Midnight Oil Summit over the past few years. I have been pretty much nah its okay. Though this year I am definitely going. It is a conference that I can only liken unto MegaFest hosted by TD Jakes. There are events for families, women and men. I look forward to seeing the flash mobs and might enjoy one of the prayer picnics. I am also looking forward to the live album recording. After all praise and worship is my favourite part of any event. Midnight Oil Summit takes place 18-20 July 2013 in Birmingham. The 18th is a separate ticketed event for leaders. The 19th and the 20th are the main events. Pray for me, that me and (yes) my boys can wake early enough to attend Prayer Plus. I have heard so many good things about it. I am quite excited and praying that my day to day life doesn't get in the way. I am ready to learn and grow and get my praise on. Tickets for the 19th and 20th is £20 and will get you into both days. There are no concessions. Do not let that put you off. This is going to be an amazing event and will be worth every penny. Watch the video below.